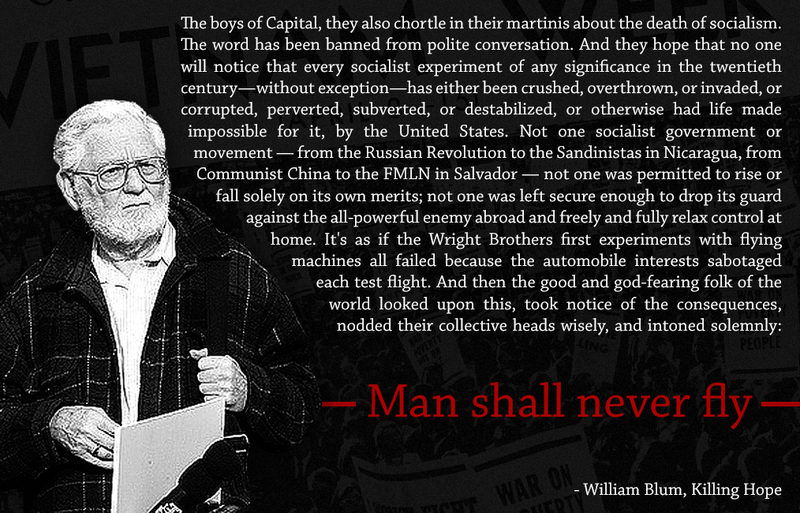 Below is a final speech given by Bill Blum the author of numerous books and editor of the Anti-Empire report. Blum died recently and he is sorely missed. A memorial service will be held for him tomorrow in Washington, DC. We are unable to attend because we will be in Venezueala helping to stop a US coup. If you can be in Washington, DC we urge you to attend the memorial. It is being hosted by Covert Action Magazine and will take place on Saint Patrick’s Day, Sunday, March 17, from 4:00 to 7:00 PM, in the Washington Ethical Society building at 7750 16th St. NW (corner Kalmia Street), Washington, D.C. 20012. Special guests—to be announced—will be speaking including Bill’s wife Adelheid and his son Alexander—both whom are coming from Germany. There will also be videos of Bill, a question and answer period, and a reception with food and drinks. — The S4 bus line stops at 16th St and Kalmia, right in front of the door. — The Silver Spring metro station is a short 15-minute walk away. — Sunday parking is ample and unrestricted on both sides of the street. And Americans genuinely wonder why the rest of the world can’t see how benevolent and self-sacrificing America has been. Even many people who take part in the anti-war movement have a hard time shaking off some of this mindset; they march to spur America — the America they love and worship and trust — they march to spur this noble America back onto its path of goodness. Many of the citizens fall for US government propaganda justifying its military actions as often and as naively as Charlie Brown falling for Lucy’s football. The American people are very much like the children of a Mafia boss who do not know what their father does for a living, and don’t want to know, but then they wonder why someone just threw a firebomb through the living room window. So the next time you’re up against a stone wall … ask the person what the United States would have to do in its foreign policy to lose his or her support. What for this person would finally be TOO MUCH. Chances are the US has already done it. Keep in mind that our precious homeland, above all, seeks to dominate the world. 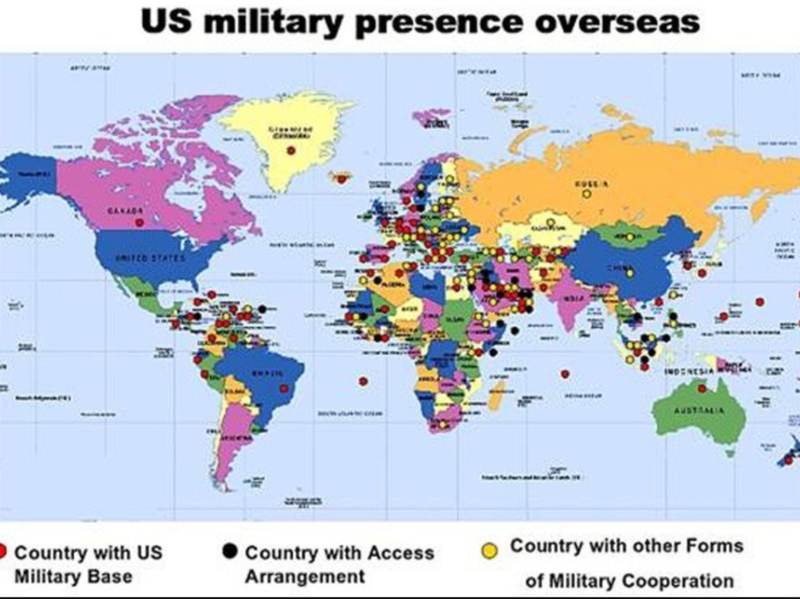 For economic reasons, nationalistic reasons, ideological, Christian, and for other reasons, world hegemony has long been America’s bottom line. And let’s not forget the powerful Executive Branch officials whose salaries, promotions, agency budgets and future well-paying private sector jobs depend upon perpetual war. These leaders are not especially concerned about the consequences for the world of their wars. They’re not necessarily bad people; but they’re amoral, like a sociopath is. Next came Libya; again, a secular country, under Moammar Gaddafi, who, like Saddam Hussein, had a tyrant side to him but could in important ways be benevolent and do some marvelous things. Gaddafi, for example, founded the African Union and gave the Libyan people the highest standard of living in Africa. So, of course, the United States overthrew that government as well. In 2011, with the help of NATO we bombed the people of Libya almost every day for more than six months. For documentation on government overthrows, bombs dropped, attempts to assassinate foreign leaders, movement suppression — see Killing Hope: U.S. Military and CIA Interventions Since World War II. I’m sorry but I must pull the rank of someone infinitely more streetwise than the late Mr. Blum and — though I commend his work in general — disagree entirely with his (sadly mistaken) hypothesis about the USian people. And it is in precisely that context I have repeatedly observed throughout a journalism career now extending into its sixth and terminal decade the majority mentality of those creatures Mr. Blum mistakenly termed “Americans” rather than USians is merely a low-grade adaptation of and/or submission to the purposefully ecocidal schemes of their socioeconomic masters. It is in fact the same morally imbecilic program deliberately divested of any purpose save hatefulness — the same hatefulness proven and now multiplied to the Nth power by the Trump/Pence Regime and its ever-increasing ranks of ChristoNazi collaborators. I know this because, unlike Mr. Blume and his colleagues, I am not only as much an on-the-street, in-the-neighborhood proletarian as the people I cover and for whom I write, I am also a Marxist, which enables me to see clearly the venomous miasma of white Christian hatefulness that underlies the USian Exceptionalist variant of German Nazism. Which means USian Exceptionalism can only be overcome as its hatred-based Germanic predecessor was overcome, a horrible truth even the most revolution-minded USians cannot stomach because of what it means, for a brief but telling glimpse of which Google Red Army Girl in Berlin (1945). I can’t help wondering how more violence can solve the problems caused by violence? Another article today at Popular Resistance: Giving War Too Many Chances. History proves that when assaulted by Nazis — whether of the Original Brood or its ChristoNazi subspecies — one has but two choices: fight or die submissively. Which then would you have us do? In the real world, those are NOT the only two options. Please elaborate (if you can). You and I seek nearly identical humanitarian goals. Our difference lies in your ignorance of history, to the study of which I have devoted nearly an entire radical-activist lifetime, 79 years at the end of this month. That;s why I (sadly) acknowledge the ultimate in-all-probability terminal truth so proven: that the forces of Capitalism — the omnipotence of the Infinite Evil that now grips our species and our Mother Earth in apocalyptic stranglehold — cannot otherwise be defeated. To elaborate just a bit on what I said at the beginning: when attacked by Capitalists — sub-humans whom at heart are indistinguishable from the very most malevolent Nazis — one has but two choices: fight, or die in craven submission. And the aftermath of the 1960s has already irrefutably proven the vast majority of the Moron Nation population is too ignorant, too deluded — or just too damn lazy — to do anything but the latter. I prefer making a much longer and deeper analysis of “history” and psychology than just accepting the worst characteristics and aspects of humanity’s brief, 6000 year experiment with dominator hierarchies as being immutable and impossible to circumvent or eliminate. I also can’t buy the notion that the tools that create the problems are the only ones to use to fix them. And there’s ample proof in other models where popular permission to dominate has been withdrawn and allegedly monolithic structures collapsed with relatively little violence: the Zapatistas and Nicolae Ceaușescu’s Romania are two that leap to mind. Actually the “Forever War” began in 1918 when the United States economically arm-twisted its allies into joining its typically genocidal invasion of the embryonic Soviet Union and — in the resultant Russian Civil War (1918-1922) — sewed all the seeds of the U.S.S.R.’s eventual destruction and most likely the destruction of our planet as well. As to the “6000-year experiment with dominator hierarchies,” what you are actually citing is the triumph of patriarchy — an infinitely savage totalitarianism originally fostered by the apparent “magic” of fiery wheels, talking snakes and loquacious burning bushes, its doctrines based entirely on the misogynistic hatred of Nature and femaleness in general. Hence the definitively violent Male Exceptionalism that destroyed at least 140,000 years of matriarchal order and festered and metastasized into the unavoidably apocalyptic ethos of USian Exceptionalism. It is not only Capitalism but its patriarchal foundation that must be eliminated if our species is to have even a minimal chance of survival. In fact the Counterculture of the 1960s was — beyond the Mainstream Media Propaganda Machine distortions and Big Lies that destroyed it — the first wave of the anti-patriarchal revolution, but it was suppressed so swiftly, brutally and methodically, it was denied even the opportunity to discover its own aesthetic unity. Which does not change the terrible truth of our Mother Earth’s ultimate challenge: socialist revolution — precisely the global socialist revolution the original Russian Bolsheviki intended — or extinction. I say again, when Nazis attack, we have but two choices — and the Nazis whether existential, political or theological have been triumphantly assaulting us for (just as you say), 6000 years. Thus — especially given how the U.S. military is already exterminating the Zapatistas and Romania has gone avowedly fascist — I repeat my question. What would you have us do? In the dialogue below I see no reference to dialectics, wherein the internal contradictions become so acute that the system can no longer continue in the old way and something new is forced int existence. I perceive this to be the case in this era, with eco-socialism as the synthesis that transcends both the corporate capitalism we know so well and the decrepit state capitalism (masquerading as socialism) that the USSR became, betraying its initial promise. I believe we don’t disagree much about history, root causes and the parameters of the systemic disease. Well, the Zapatistas are actually surviving and thriving but they have geographic advantages that most self-hypnotized captives of dominator hierarchies don’t enjoy. But I still assert that the most important single thing that anyone can do is free their mind. Then if that level of freedom can reach critical mass, we’ll see. I doubt that a cadre of “left leaning” folk hoarding AK47s will be able to “overcome the Nazis” (or the 82nd Airborne) though. While you are correct untrained civilians with AKs most assuredly could not defeat the soldiers of the 82nd Airborne Division (or any of the other kill-hardened members of the imperial war machine who gleefully perform Waffen/SS duties), properly trained civilians could use those AKs — or for that matter mere .22s — to obtain far more effective implements. Back in the day — long before the advent of civilian-owned AKs and AR-15s, and in the era when most USian males whether Of Color or white were military trained — there were many activists who when individually attacked could give very good accounts of themselves with surplus M1903 Springfields, M1917 Enfields, M1898 Mausers, sundry shotguns and handguns and what (according to pictures by the photographer Joffre Clarke) was the favorite rifle of the Deacons themselves, the British Lee-Enfield Nr. 4 Marks I and II. But in truth the vast majority of the “properly trained” people of today’s generations have already been brain-warped into trustworthy Nazism or they would never have been allowed out of the military alive. Yes I truly believe things are that bad — infinitely worse than under the earliest years of the German Nazis because technology, which in Capitalist hands is always Evil, has truly given our overlords the power of gods. It is an omnipotence so absolute it can be overcome only by apocalypse-sized natural disaster or military conquest from without. Remember the real reason our masters ended the military draft was not because they suddenly became anti-war activists; it was instead because they awoke to the fact the Vietnam Era USian Empire was making the same mistake the Romanoff Tsars made: providing military training to potential revolutionaries. Hence the draft will be resumed — as it in fact a few members of the Democratic (sic) Party are already urging it — only when our overlords decide we are all Nazified enough to again be trusted with military training. Given the fascist consciousness insidiously imposed on minds already twisted far to the right by K-12 curricula that include compulsory readings of Ayn Rand, that is undoubtedly less than a decade away. As our masters have obviously learned — this no doubt part of the methodology of oppression that is the legacy of the innumerable Nazi war criminals given sanctuary by the U.S. government and its Capitalist owners — the best way to kill a movement is to order the Mainstream Media Propaganda Machine to turn it into a fad. But long before the return of the draft — indeed as part of the preparation for its return — we will surely see the Empire’s zero-tolerance omnipotence manifest against all of us when Trump and his ChristoNazis start their Last Roundup, which I suspect is at most maybe a year away. At that point our masters will be focused on eliminating most if not all non-Trump voters, and the only remaining goal of dissidents will be avoiding torture. I frankly hope to be dead by then, and the medical probability is that I will be. For once the Last Roundup begins, the only choices left to the dissident community (and ultimately to the entire non-ChristoNazi community), will be between slow death by torture in the unspeakable horrors of concentration camp, a relatively quick death for allegedly “resisting arrest” or outright suicide. accordingly — you will recognize what is being done to us is (apart from its situationally different timing), precisely the same method by which Hitler assured himself of the German population’s 100-percent loyalty. Again more of the obvious Nazi legacy so enthusiastically embraced by the Empire. As to the notion people can somehow magically “free their mind(s),” from fascist conditioning, I don’t believe it. That’s why I believe we — our species and our planet — are genuinely doomed. Indeed I reject nondeterminism entirely. I was raised by a Marxian father, and every real socialist I know (or ever knew) had similar inputs.